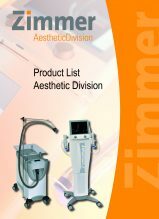 Please browse the Aesthetic Division Product List. You may view and download this list. Find information about our repair and maintenance parts. You’ll also find accessories to add function and convenience to your Zimmer product. Additionally, please visit our shopping site. Many parts and accessories are available for online purchase 24 hours a day, seven days a week. All genuine Zimmer products are made of premium quality and durable materials. Please feel free to contact us any time with your maintenance or related questions. Most importantly, we are here to help you ensure long life for your Zimmer unit.